First off, let’s clear up any confusion about the name of these pancakes. Yes, they are called roll-up pancakes. No, they are not rolled up in the photos. That’s because this recipe comes from my husband who grew up eating these pancakes and his family always rolled them up to eat them. But then I came along and broke tradition. I find rolling them up too much work most mornings and settle for just folding them in half. On some mornings, even that is more than I can handle and I eat them open face. But, we still call them roll-up pancakes. Regardless of how they are eaten, these pancakes are a protein powerhouse. With cottage cheese and eggs making up the bulk of the batter, you get a boost of calcium along with the protein. I practically lived on these pancakes when I was pregnant because they were such an easy way to get more protein and calcium in my diet. And when my kids were young and they didn’t like the texture of meat and considered runny egg yolks gross (inconceivable! ), these pancakes saved our sanity. Even if you don’t need a gluten-free option, these pancakes are great. We normally make them with all-purpose flour since we (thankfully) don’t have any dietary restrictions in our household. However, we do have several friends who are gluten intolerant and we wanted to be able to share this recipe with them, so my husband suggested trying it with a gluten-free flour. Since the recipe doesn’t call for very much flour, swapping a gluten-free flour blend for the all-purpose flour was super easy and kept the texture and flavor intact. Unlike traditional pancakes, these pancakes taste best with a schmear of your favorite jam instead of the usual maple syrup. They are also best when eaten warm and fresh (but then again what pancake ever didn’t benefit from warmness and freshness). 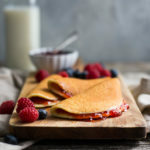 To help you along the hot fresh pancake path in the morning, the batter can be mixed up the night before and stored, covered, in the refrigerator overnight – because who doesn’t want some extra sleep in the morning. Blend cottage cheese, eggs, flour, oil, and salt in a blender until smooth, scraping down sides of the blender pitcher as necessary. Heat a heavy non-stick skillet over medium-high heat until hot (To test it, flick a little water into the pan. The water should skitter across the surface.) Lightly coat the skillet with non-stick cooking spray. Working in batches, for each pancake, pour a scant ¼ cup of the batter into the skillet and cook until bubbles form on the surface, the edges are a little dry and the underside is lightly browned, about 2 minutes. Flip the pancakes and cook until the bottoms are golden brown, 1 to 2 minutes more. Spread desired amount of jam on each pancake, roll up (or fold in half), and enjoy. I used King Arthur gluten-free multi-purpose flour blend. You can also use unbleached all-purpose flour if you don’t need a gluten-free version. The pancake batter can be mixed up ahead of time and stored, covered, in the refrigerator overnight. I used to live off something similar when I was in college. Your version looks much prettier and tastier! I’ll try them gluten free as a high protein breakfast during holiday season. Thank you! Thanks, Leslie. Let me know how they turn out if you get a chance to try them. Hey mom, I just made this recipe. It wasn’t as good as when you make it but it was still pretty good. What was different about them? Make sure you blend the batter long enough so that it’s completely smooth. Also, if the batter is really thick and doesn’t spread out enough in the pan, you may need to use a knife to spread it out so your pancake isn’t too thick. Let me know if you try this again or we can make some when you are home.